You can use three types of cell references in Excel 2010 formulas: relative, absolute, and mixed. Using the correct type of cell reference in formulas ensures that they work as expected when you copy them to another location in the worksheet. Formulas and functions are at their most useful when using references, so you need to understand them. In cell B2, enter 100. In cell C2, enter =B2*2. Cell C2 now returns the value 200. Press Ctrl+C or click the Copy button on the Home tab. Press Ctrl+V or click the Paste button on the Home tab. If you see a moving marquee around cell C2, press the Esc key. Cell C3 should be the active cell, but if it is not, just click it once. Look at the Formula bar. The contents of cell C3 are =B3*2, and not the =B2*2 that you copied. What happened? 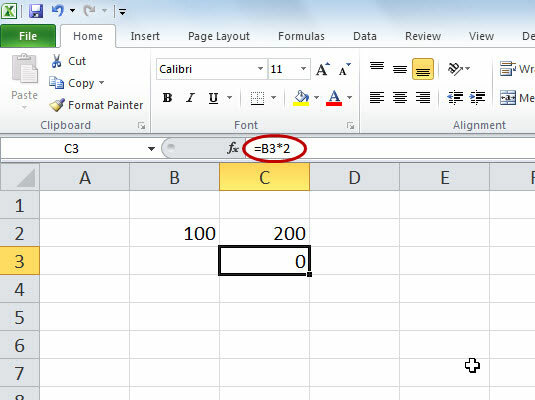 Excel, in its wisdom, assumed that if a formula in cell C2 references the cell B2 — one cell to the left — then the same formula put into cell C3 is supposed to reference cell B3 — also one cell to the left. Relative references adjust when you copy a formula. When copying formulas in Excel, relative addressing is usually what you want. That’s why it’s the default behavior. Sometimes you don’t want relative addressing but rather absolute addressing: making a cell reference fixed to an absolute cell address so that it doesn’t change when the formula is copied. Relative =A1 Both the column letter A and the row number 1 can change. Absolute =$A$1 The column letter A and the row number 1 do not change.